A go-to charger of choice is a surprisingly personal decision. It isn't just about delivering fast, reliable power but also which devices it is able to charge, as well as how it looks and feels. A charger will live in your bedroom, on your desk, or in a common room of your home and needs to balance looks and functionality. Apple's own AirPower is still entirely missing and the iPhone maker remains mum on the matter. 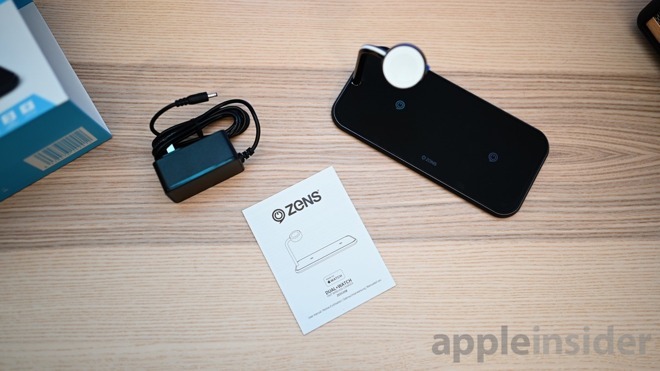 This leaves a charger-sized hole in the market for premium multi-chargers which is where units like Zens come into play. Announced earlier this year during IFA there are several different models within the Zens lineup -- charging pads, dual chargers, and more. We were most keen to get our hands on the Dual + Watch model which integrates a dual charging pad with an elevated Apple Watch charger. A dual charger is great for multi-phone homes or if you want to wirelessly charge your AirPods. We should eventually see Apple's wireless charging case regardless of what Apple is doing with the AirPower, or you can grab one of the aftermarket solutions that have cropped up in its absence. We adore the fit and finish that has gone into the Zens Dual + Watch wireless charger. It is part of the "aluminum series", which is noticeable by the extremely thin base. That base is made of said aluminum with a soft-touch plastic top that protects your phone and allows the Qi charging to function. On the left side of the device is the Apple Watch charging puck -- certified through Apple, of course -- which floats a bit nervously above the charger itself. Holding the puck up is a dark-chromed stainless steel post. It's almost indescribable with the glossy finish, but a white wire is tucked into this pole to deliver power. A visible wire isn't our preferred solution here, especially when it could have been tucked on the underside. 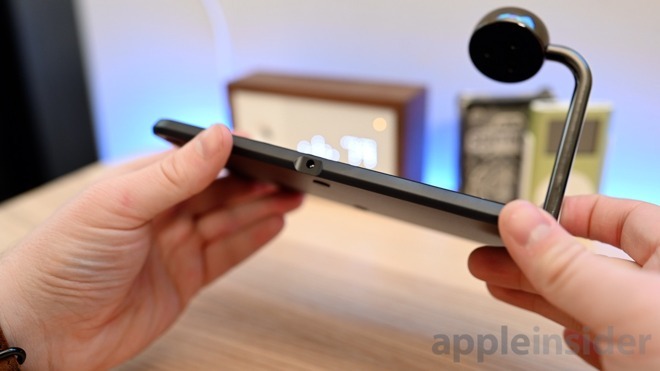 This is the thinnest charger we've seen yet, only raising itself 8mm off the surface of a table. 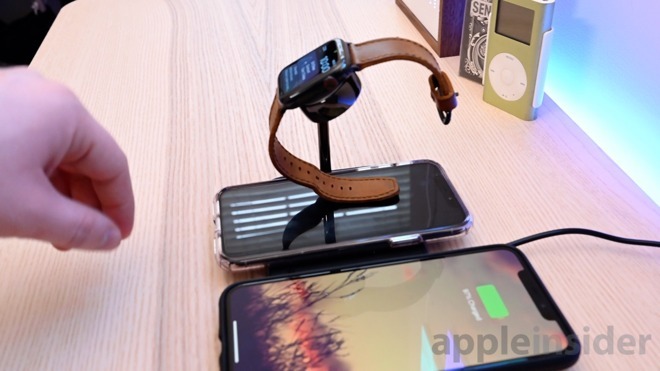 The Zens Dual + Watch is a wireless charger after all, which means using it is as simple as it gets -- just place your device on the charger and let it power up. Precision placement on cheap pads can be a problem, but the the charging radius seems fairly large on this unit, and we had no issues getting our iPhone XS Max to start accepting power when we placed it on the mat. Zens supports 20W of power here, which means 10W to each coil at a maximum if your device supports that much. As usual, iPhones are limited to 7.5W of power -- and Zens has optimized this dock for that limit. Positioned on the front, are two LEDs that light up to signify that either wireless device is currently charging. This kind of bright light isn't our favorite, and we find it a bit obnoxious. When bedside, those LEDs happen to be right near eye-level, and can be frustrating when trying to sleep. 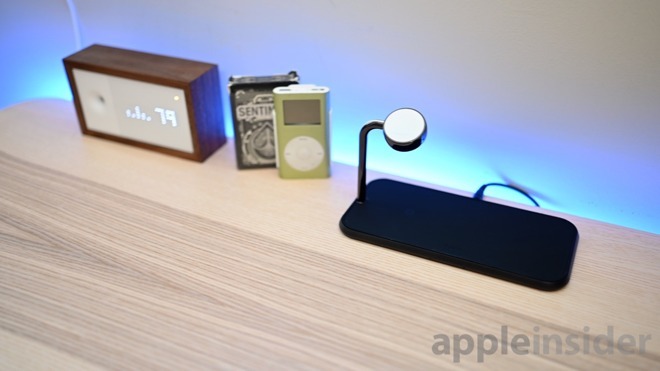 Others have taken smart solutions like the Nomad Base Station + Apple Watch that uses an ambient light sensor to dim the LEDs when it is dark. ElevationLab chose to exclude a status LED entirely on the NightPad Charger. We'd have preferred either of those solutions here. When charging your phone, it needs to be placed perpendicular to the charger, due to the limitation of charging coils contained within. Rather than include one in the center that would have allowed for charging along the centerline of the charger, you are stuck with them protruding from the sides. Zens has put together a great charging solution. It is fast, reliable, and looks great. However there are two issues we have with the device. First, there no additional cabled outputs. You can power up three pieces of gear here, but you can't power up anything else. On Nomad's original Base Station they include USB-C and USB-A outputs on the rear and they've become indispensable. Using these additional outputs, you can power up an iPad, a second Apple Watch, a battery pack, a camera, or any of your other gear. If this is in your bedroom, you may not have a large amount of stuff to charge, but living room or office placement -- as ours is located -- may need to serve a larger purpose. 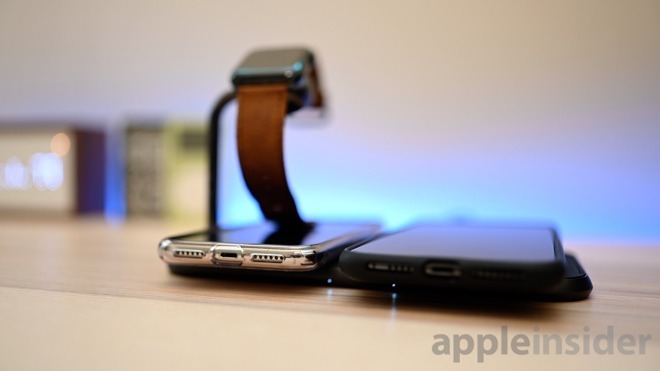 Second, perching our Apple Watch above our iPhone isn't ideal. Depending on the band, it can rest on the phone itself. Or, heaven forbid, the watch ever fall from its magnetic holder and land atop your iPhone. At the cost of Apple's devices, we'd prefer if no harm would come to them. The Zens Dual + Watch is an excellent charger that will charge all the devices you need for the day quickly. There are many more options here and it takes up far less space than two independent wireless chargers and one for the Apple Watch. We were irked by the phone placement, but when charging two devices -- as many will -- this point becomes moot. The only remaining criticisms include the wire for the Apple Watch puck and the lack of outputs, but these are not only easily overlooked, many won't care at all. When we are dealing with the upper echelons of wireless chargers, the only deficiencies are rather minor. Personal preference of one over another can be more attributable to the physical look and design than these passable qualms. 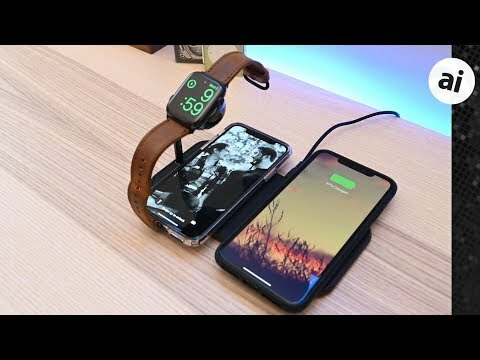 The Zens Dual + Watch aluminum wireless charger is available from the maker's website, and their other chargers are available on their Amazon storefront. Good review and a question: Charging the iPhone is limited to 7.5 watts, and the 29 watt charger is approved by Apple for use. I’ve heard that using the rapid charger will shorten the iPhone’s battery life. Is there any truth to that? This is true for any Lithium-Ion battery. With high charge rates there is a slight degradation of the battery. This happens slowly over time. Same happens when they are completely drained to past their nominal voltage or always left @ 100%. 80/20 is where they like to stay. Though Apple sets what voltage 0 and 100% is. 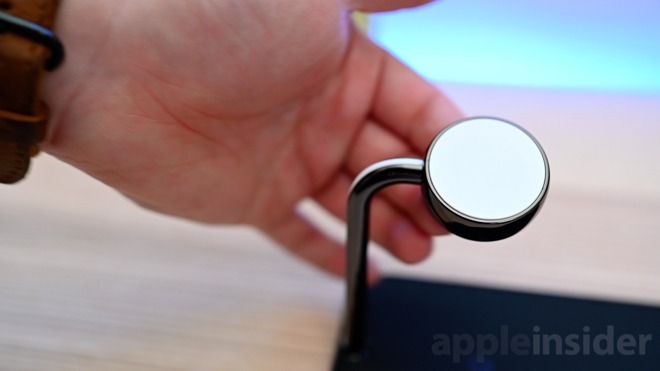 I'm a little unclear on what you're saying about the AppleWatch puck. (It's early here, so maybe my brain just isn't awake yet.) It looks to be integrated to the unit, but you seem to be saying that the wire is visible? (Is the word "indescribable" meant to be "indiscernible"?) Is the charging puck just an Apple unit that's been put in the holder with the cable tucked into the post? Yup, that's exactly what they mean. You can see the white wire in the above photo -- it's on top and could be mistaken for glossy reflection on the pole. Re: "Apple's own AirPower is still entirely missing and the iPhone maker remains mum on the matter. This leaves a charger-sized hole in the market for premium multi-chargers which is where units like Zens come into play." Perhaps we should turn up the wick under Apple's feet on this and start referring to AirPower wireless charger as the AirPromise wireless charger. That's what I thought it was, until I later saw my own comment. Possibly the contrast from the quote background made it more noticeable. Or it might be I was looking at it on an iPad, then on my MBP. Or maybe it was just early, and visual processing wasn't quite up to speed the first time.